Once you have a well-crafted log line, the next step is creating a professional query letter. We’re going to use this query letter in a variety of places but mainly it’s going to be used to send directly to agents, managers and producers. These types of “cold queries” can work but only if you do a ton of them. In the next few lessons after this one I will dive into the nuts and bolts of locating potential agents, managers and producers who might be willing to read your screenplay. In most cases, before you submit your screenplay to a producer you’re going to need to submit a professional query letter to pique their interest so that they request the full screenplay. There is more than one way to write a good query letter, and my approach may not be for you. I’ve actually seen some zany/creative/off-the-wall query letters work, so if that’s the sort of screenplay you’ve written and that’s the sort of personality you have, don’t shy away from that sort of query letter. As always in the entertainment industry, creativity counts! Hopefully my examples will give you some ideas and get you started, but also try and develop your own style and voice. Keep in mind the main goal of what you’re trying to do. You’re trying to get the person who reads your query letter to request the full script. That’s really all there is to it. While this seems obvious, always keep it in mind and if there’s something in the query letter that doesn’t serve that purpose, cut it. Next, I put in my log line pitching my script. I’ll often include two log lines for two different scripts, depending on where I’ve found the listing and what I think they might like. It seems like including two log lines increases my success rate quite a bit as the person might not like one story idea but might like the other. Unless the producer has requested scripts in a very specific genre I typically choose log lines for scripts in very different genres to mix it up a bit. In other words I’ll pitch a comedy and a horror thriller in the same query letter to cover more ground in terms of genre. Quite often the producer will request both scripts. I’ve never tried including three log lines in one query letter, but who knows, that might work even better. I should probably test it and see. As a rule though, if time and money aren’t a huge issue, I would just put one strong log line in a query letter and blast it out. Just send twice as many query letters so that all of your polished screenplays get their own query letters. After the log lines, I include a brief paragraph about my writing background. I list my writing credits and mention a script or two that is currently optioned. I feel like this will separate me from the pack a bit since many people don’t have any writing credits. If you don’t have any credits you can list whatever credentials you have that are pertinent to the script you’re pitching. For instance, if your script is a police drama and you were a cop, mention that in your letter. It adds authenticity to your script and a producer will like that. If your script is a comedy and you’re currently a member of a local improv group, mention that. The producer might be from the same area of the country as you and might have heard of the improv group (you never know) or they might have done a bit of improv themselves back in the day and really respect the talent and dedication it takes to be an active member of an improv group. Use whatever credits you have no matter how small they might be. Don’t underestimate yourself. Did you work as a journalist for a few years? That’s professional writing experience. Did you win an award in college for a short play you wrote? That’s worth mentioning. Did you earn an MFA? That might be impressive to a producer. There’s usually a reason why you wrote a script which gives you some extra credibility and you should think about that and try and tie that in with your writing credentials for the script you’re pitching. I expanded on this in my post What Should The Query Letter Say When You Have No Screenplay Credits. I also include a link to my screenwriting website where I have log lines and synopses for my other screenplays. In many cases I’ve had a producer read one of my query letters or screenplays and, while they didn’t want to pursue that specific screenplay, they did like the writing enough to look at my other log lines and request another script. So if you don’t have a screenwriting website, get one. As part of my screenwriting marketing tools I actually offer this exact service. Check out this post to learn more: Why you need a screenwriter website. Below is a sample query letter so you can get a feel for how it would look in context. I wish to submit my feature length comedy screenplay, Dish Dogs, to you for consideration. Dish Dogs is the story of two college graduates, fed up with society and eager to gain some measure of free will; so they drive around the country in a 1958 Ford pick-up truck washing dishes. It’s Easy Rider meets The Graduate for a new generation. I’m a produced screenwriter and have optioned and sold many scripts over the last few years. I recently sold a film noir screenplay, Rushlights. It stars Josh Henderson, Beau Bridges, Aidan Quinn, and Haley Webb (http://www.imdb.com/title/tt1536437/). And before that I sold Man Overboard, a broad comedy screenplay. It’s currently in rotation on cable television and can be found in video stores across the country including Netflix and Amazon.com (http://www.imdb.com/title/tt1186829/). My website, www.ashleymeyers.com, has synopses for many of my other screenplays. If you like my writing style but the above mentioned script does not quite fit your current needs check out my website and let me know if you’d like to read any of my other scripts. Thank you for your time and consideration. Please let me know if you would like to read the full screenplay and I’ll get you a copy immediately. If you would like to receive notes on your query letter, consider joining my paid services which includes access to the SellingYourScreenplay.com forum. In the forum you can post your query letter and get notes on it from me and the other members of the forum. In addition, in the forum there are lots of real life examples of successful query letters that I and other writers have used. 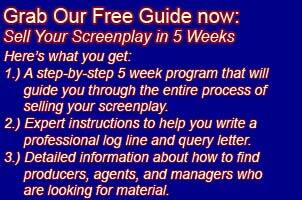 Go here to learn more: Screenwriting Marketing Tools. If you print out your query letter or plan on using it for faxing use the MS Word Headers/Footers feature to add a header with your name and a footer with your complete contact information. Make sure you include contact information at the end of the letter, too, so it’s easy for the producer to either email you or call you. Include both a phone number and email address! You never know what contact information a producer prefers. Don’t make it hard for them to contact you. In the old days when I sent out snail mail letters I used to include a self-addressed stamped postcard so that the producer could easily respond to me. I still think snail mail letters can work since very few other people are using them, but I don’t think you would need to include a self-addressed postcard as it seems most people will just email you or call you to request the full script. Always address your query letter to a specific person at the company if possible. You can usually find this information where you found the address information (more on finding the list in the next lesson). If you don’t have a specific person’s name you can address it to the “Director of Development” but that should be a last resort. Do not beg. Avoid writing things like, “I know I have the talent, I just need someone to give me a chance.” There’s the old saying “show me don’t tell me.” If you’re so talented let your writing speak for itself. Do not write about how great your script is. Avoid writing things like, “I’ve written a modern masterpiece that is destined to become one of the top box office hits of all time.” Again, let your writing do the talking. Do not mention any names who you think would be perfect for your project. Avoid writing things like “I think Spielberg would be the perfect director and I have Tom Cruise in mind for the lead.” It’s unlikely that anyone reading your query letter has any connection to anyone you might mention. However, if you have a personal connection with name talent and they’ve agreed to help you with the project that is worth mentioning. But make sure it’s the truth because you will be called out on this. Do not mention how much money you think you should make for the script. You’re trying to get people to read the script not negotiate a deal. It’s irrelevant at this stage. If you plan on acting in or directing your screenplay do not mention it in the query letter. This is a huge turnoff and an amateur mistake. If you do want to star in or direct your film (which is highly unlikely and will probably doom your project) you’re going to have a much better chance of getting yourself in that position after they’ve read your screenplay and like it. I don’t recommend that you try this at any stage, but certainly this information does not belong in the query letter. Notice none of these “things to avoid” are in any way helping you get the producer to read your material. They’re all turnoffs and the only thing you’re trying to do with a query letter is get people to request the full script from you. Don’t write anything that doesn’t help you do that. While these “things to avoid” may seem comical to some, I’ve worked for a few agents and production companies and have seen these sorts of letters and worse. I read a piece of advice years ago about how to be treated like a professional when you haven’t actually sold or optioned anything. It went something like this: “if you act like a professional you will be treated professionally.” It’s really that simple. There are many small details to the query letter which I’ve written about in other posts. Check out the query letters tag on my blog for all sorts of additional information that can help you write a winning query letter: Screenplay Query Letters.